UPPER WEST SIDE — At one local school, learning to become an environmental activist is built into the curriculum. Sixth-graders at a new middle school have become galvanized around protecting the future health of the Hudson River, creating investigative documentaries, writing elected officials and launching a petition that's garnered hundreds of signatures. The new West End Secondary School (WESS), which opened with an inaugural sixth-grade class this September and will add a grade each year, uses the city as an extension of the classroom. The administration capitalized on the West 61st Street's school's proximity to the Hudson River, which is just an avenue and a half away, making it the focus of one of the first interdisciplinary projects. But just learning about the river wasn't enough, said Principal Jessica Jenkins. Students also turned their attention to activism on behalf of the waterway. Now, they're pushing Gov. Andrew Cuomo to renovate the city's sewer system so that excess sewage doesn't deposit directly into the Hudson during major storms as it does now, they said. The 137 students created a Change.org petition addressed to the governor that as of Friday had 748 signatures in the two weeks since it launched. "All of the kids are engaged," said Jenkins on Thursday, as the students presented their work to middle and high schoolers from the adjacent P.S. 191 and the Community School for Social Justice in The Bronx. Take Two Film Academy had a two-month residency at the school, during which filmmakers taught students how to make documentaries, including how to storyboard, write and voice scripts, find and edit B-roll, and put everything together using the editing software Final Cut Pro. "This is advanced stuff," said Megan Kiefer, a Take Two Film Academy teacher. "The film isn't the end goal, the end goal is the awareness that comes out of the film." After the films were made, Christie Marchese of Picture Motion, a firm that helps documentary films gain exposure, taught the students strategies for making a bigger impact with their projects, Kiefer said. From there, the students put their 27 films on YouTube, created the petition, penned letters to congressional representatives and wrote op-eds, she said. Making an impact is baked into the school's philosophy, Jenkins explained. Students "love that we're using the city as their landscape," which has meant going down to the Hudson to do fieldwork and reaching out to the broader community about the river, she said. Additionally, students are learning about the impact of the river's health on the local oyster population and raising their own oysters. 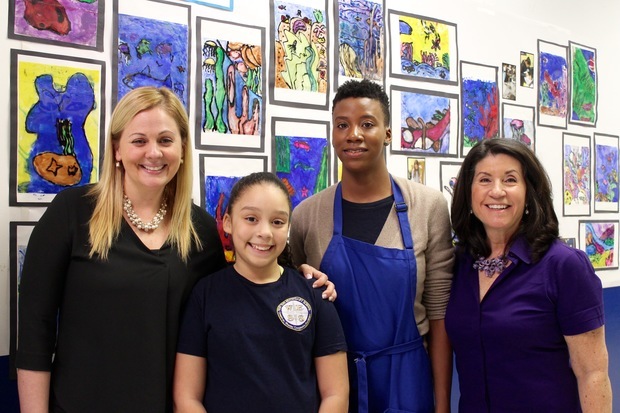 To tie arts into the project, the nonprofit arts organizations Marquis Studios and Studio in a School worked with the students to create artistic representations of clean waterways and taught them about art as environmental activism. They even got a visit from musician Pete Seeger's grandson, Kitama Cahill-Jackson, who talked about the way his grandfather turned his time and folk music to protecting the Hudson River from pollution. Parents have been thrilled by the connections the students make to the world beyond the school's doors, PTA Co-Presidents Eric Shuffler and Christine DiPasquale said. "The school's emphasis on impact meshes well with WESS' core values of resilience, creativity, compassion, and wonder," they said in an email. "Our teachers work hard to promote an atmosphere where students are required to think deeply about real world issues — which happens readily when we can connect our students to the city outside our doors and beyond." The interconnectedness of each piece of the project unit is crucial, Jenkins added. "Everything ties back to what they're learning," she said. ► NANNY SURVEY: We're digging into common practices when it comes to hiring nannies on the Upper West Side. Take our quick, anonymous survey on your nanny experience.